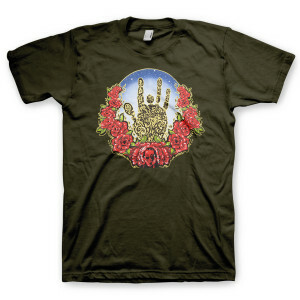 Jerry appears centered around a wreath of roses along with his iconic handprint on a city green organic 100% cotton Anvil 420 t-shirt. Great design and true medium fit. Comfortable and colorful. Jerry's fingers. Jerry's big smile. Roses. Nothin' left to do but smile, smile, smile . . . .